Question: Who is God? What is God? Physics: the science that deals with matter, energy, motion, and force. The universe and everything that it consists of is nothing’s but energy and forces in motion, which we decode to be matter. Matter does not exist. All matter is a vibration of energy. Everything in the universe is naturally a vibration, pure energy; and its all connected through quantum entanglement. Light, sound, EVERYTHING is energy vibrating and traveling in a wave. You are energy with you’re own vibration, the air we breath, the water we drink, the ground we stand on is energy with its own vibration. Energy travels in waves; waves consist of crests and troughs. According to physics, energy can neither be created nor destroyed. Energy can only be converted, it is never exhausted. If the universe and everything in it is energy then nothing created it, and it cannot be destroyed. If nothing created the universe it must mean the universe has always been, and will always be in existence. This must mean time is nothing but an illusion which does not truly exist in the manner we perceive it; it’s nothing but an illusion. We are as much part of this universe as is every other living organism and everything which we consider not to be conscious. We are living and conscious, and a part of the universe; because we are alive and conscious, so is what we are a part of. We are a part of the living conscious universe, we are the universe. Christianity, and the Mark of the Beast 666. Six Hundred Three Score and Six, 666, is what the bible tells us is the mark of the beast, today Christians call the RFID the mark of the best because the bible also says those without the mark can neither buy nor sell goods. I dont understand why we dont consider money the mark of the beast. Money, the root of all evil. I believe the word Mark is meant as a signature, or name. 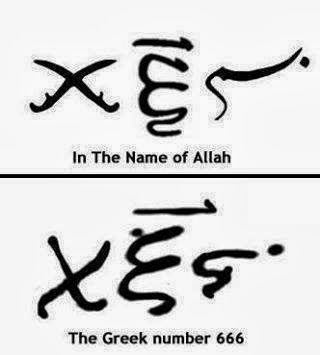 Isn’t this interesting, Allah is the number 666. If we really were created by an intelligent being, he must have been extraterrestrial, not divine. The bible calls this god YHWH, or YahWeh. We were created as slaves and this mark in our DNA is just his, let say, trademark of his ownership of our species. The world we live in is a mystery to most people alive today. Only very few know the truth about our history, the universe, our existence. Nobody outside of a secret society knows the truth. In order for us to know the truth we must let go of what we have been brought up to believe; not just throw it out, but use it as a tool to seek the truth. In order to know the truth, you must not be afraid to understand it. To know the truth you must think logically and look to the facts, you must realize that the truth is being kept hidden, you must realize that there are many different beliefs in this world, you must also realize there are many different perspectives for each and every one of these beliefs. It is completely naive for any individual to believe he or she knows the truth, especially in a world where people work very hard in order to keep the truth from surfacing. You can look towards history, science, or religion to find the truth but you must realize that they have all been grossly manipulated to keep us in the dark. Not a single person was brought up to believe the truth, nor can you find it through mainstream science or history. Mainstream science and education today is completely distorted by the powers that be. Anyone who goes against the status quo ends up having a hard time finding employment, and if they become a thorn in the backs of the elite, they are taken out. Every text book, every scientific article, and every scientific innovation is presented to the world with approval of the elite. People that currently have faith or belief in a myth are a force against the truth. Believing in things that do not exist is the worst thing you can do. Religious people want to believe so badly, they will ignore scientific evidence, reason, common sense and their own better judgment. Religion perverted the meaning of the word truth. Many things religious people say they believe are not in accord with fact or reality. They are myths, superstitions hope, not truth. To say it is truth is a lie. The ones that do not know they are lying think they are doing the will of the enemy of their god, Satan, who is defined in the holy books as the great deceiver, the king of all lies. All of todays religions have been created to manipulate the truth and control the human population and keep them as unthinking, hard working, law abiding, tax paying, god fearing death slaves. History as we know it today has been warped. Everything we learned in school has been completely manipulated, so much it is like it never really happened; but a cover story for the truth. Everything, from what we watch on television, the News, to what we learn in school and the books we buy from publishing companies, even the corporations and banks that control and dictate our governments, politicians, and laws are in complete control of the 13 richest families, known as the council of 13; who we call the Illuminati. They control everything you watch, everything you read, and all the music you listen to. In the past, unlike today, the elite claimed they had the divine right to rule; they claimed to be direct descendants of the gods. The oldest writings discovered are known as the Sumerian Tablets. The Sumerians are one of the first human civilizations to have existed. They knew much of what the rest of the world had to rediscover, it was as if the information they possessed had been given to them. According to the Sumerians, the Annunaki, an alien species, came to earth in search for gold which would be used to save their dying planet. Those who were sent to earth to retrieve the gold and did not want to do the work themselves took their own DNA, and the DNA of many different species native to earth, in order to genetically engineer a new species they could use as a slave race to do the work for them. This new species would be less intelligent than the Annunaki and much weaker so they could be easily controlled. This new species is the human race; because of this, the Annunaki, are known as fallen angels, or demons. What they did to our genome and our species was considered a sin against the universe. In reality, we are all direct descendants of the Annunaki, every human being today has reptilian DNA; the only difference between the elite and the rest of humanity is that the elite are decendants of humans who physically bred with the reptilian race and have been interbreeding for so long, they have preserved more reptilian DNA in their genome. Throughout history, humanity has been subject to the rule and tyranny of the few rich. In the past, these rulers were known as the emperors, cesars, kings, and pharaohs; they were the monarchs, those who were in control in our past. They were the elite, who had taken advantage of humanity in the past. All of these families who ruled over our ancestors had always claimed they had the divine right to rule over humanity; they claimed they were direct descendants of the gods, those who engineered humans. Today we would consider them apart of the old world order; but this is extremely misleading. Those who are in charge of todays major industries and corporations are direct descendants of the old rulers, the elite of the old world order, and are todays elite. There is nothing new about this new world order in control today, which is trying to strip us of our right. They have done an amazing job at convincing humanity that we are free, that we have a choice; they created a system of government and social organization they completely control and dictate with their monetary system. It is not our politicians who are in charge, but the elite who put them in charge. The television is a special tool used by the elite to send a message to the public. Everything a politician or a news anchor says is only said if they are allowed to say it. Politicians, News Anchors, and hollywood actors have one thing in common, they are all actors reading a script, being used to influence, and distract the public from whats really going on. They are nothing but puppets, masks, actors for the elite. The only job of a politician is to read a script and sign papers to satisfy the public, he has no real power. Here you will see Stephen Harper read from the same script as Australian Prime Minister John Howard. It is about the Iraq war which was part of an agenda. The agenda was niether left nor right, nor did it play favorites amongst nations. These speeches were written and agreed upon by the globalist controllers part of the Cabal and then handed to the Prime Ministers to read to the people of their respective countries. Democracy never entered the picture. We never had a choice. Another thing to remember is that Canada also provided both equipment, command and troops for the Iraq war. The only job of a news anchor is to read a script, they can only say what they are allowed to say, even down to the local level. Here you can see anchors reporting the exact same story, the exact same way. There is no such thing as a republic, or a democracy, there is no such thing as freedom of press on this planet, but an illusion of what we are allowed to see and know. The entire world is nothing but a reality show for us to watch on television. We have never had any rights, we have never had a choice in any major decision that affects the state of the world. Absolutely nothing an official tells you, whether is in politics, education, the media, or in any scientific field is the truth, but only an approved interpretation or statement for events, or statistics. There is so much disinformation and manipulation out there, even for us truth seekers, it is hard to see through the fog. Disinformants have infiltrated every organization we know of which include Abrahamic religions, Spiritualism, including New Age, Alien theorism, the Truth movement, Alternative Media, third party politicians, and all other forms of truth seeking conspiracy theorists sources. Sources like Ron Paul, Mark Dice, Jesse Ventura, Alex Jones, Darryl Ankas Bashar, RT news, Infowars, Prison Planet, Reense, and other sources we look to are there just to disinform us from the truth, keeping those of us who are more aware of what goes on around us from seeing the absolute truth, and trapping us in a reality where the partial truth we have already discovered is not to be questioned, so that we believe what we have awaken, when in reality we are still in the dark. Many of these double agents will only bring a slightly better society, but not the best possible one, if we were all wake up and choose one of them to lead us; but as puppets, we would not be given complete freedom, civilization will eventually become corrupt again, and many scientific secrets would still be out of our reach. It is important to question everything you learn, and everyone you learn it from, it is possible that I am a disinformant trying to mislead the viewer; telling you to question me could be seen as a strategy to get the viewer to just trust what I say. My point being, do not let others influence the conclusion you would have come up with using your own common sense. Most of the time, we are told what the conclusion is while being presented the facts, and we either accept it, or deny it. Once you eliminate the impossible the impossible, what ever remains, no matter how improbable, must be the truth.